Here's photo #5 of The Sleepy Monday Series. 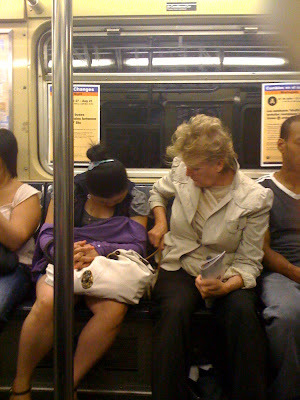 This photo was taken on an Manhattan bound A-train - the lady to the left kept falling asleep on whoever sat near her. The woman on the right had the smart idea of putting her purse in between the two of them to prevent any touching or possible drool spillage.